Puerto Vallarta, Mexico (January 17, 2019) –The famous California chain In-N-Out has always offered its customers the chance to make their burgers and fries Animal Style. With extras like mustard grilled patties, extra Thousand Island spread, oozy cheese and more, the items off the Secret Menu are over the top. Now, Velas Resorts in Mexico is upping the ante. The luxury resort collection with properties in Los Cabos, Puerto Vallarta, Riviera Maya and Riviera Nayarit offers its guests the opportunity to take their guac to the next level with traditional Mexican delicacies like grasshoppers, ants and worms. The toppings, some painted in gold and silver, are in addition to the traditional favorites like red onion, tomatoes, an assortment of hot sauces and cotija cheese. Prepared tableside, it can be paired with a choice of tequilas or mezcals from an extensive menu. 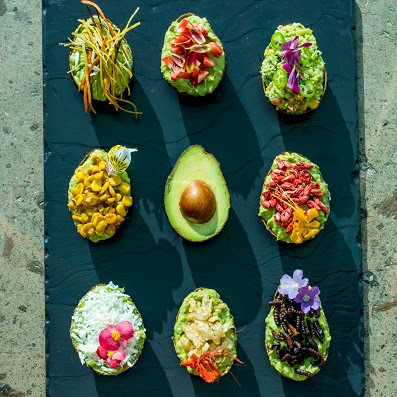 Included in the resorts’ nightly rate, the gourmet guacamole for adventurous foodies is on the heels of Velas Resorts’ $25K Taco, Insect Basket Challenge and Guacamania, a month-long fest capitalizing on the flavor and nutritional value of the avocado fruit with dedicated menu items, avocado-inspired cocktails, spa treatments, and more. Animal-Style Guac is available at the Grand Velas resorts in Los Cabos, Riviera Maya and Riviera Nayarit and Casa Velas in Puerto Vallarta. Specific offerings vary based on the resort. For Velas Resorts’ reservations or more information, call 1-888-407-4869, email reservations@velasresorts.com or visit https://www.velasresorts.com. Velas Resorts in Riviera Maya, Puerto Vallarta, Riviera Nayarit and Los Cabos have earned 52 AAA Diamonds, including the prestigious Five Diamond Award. Other esteemed international awards for their services and facilities include Virtuoso’s “Best Spa,” Forbes’ “Coolest All-Inclusives,” Forbes’ Four Star Award, and TripAdvisor’s Hall of Fame, among others. Offering unparalleled all-inclusive experiences, properties include the AAA Five Diamond Grand Velas in Los Cabos, with dramatic ocean views and unique spaces infusing every area of the resort; AAA Five Diamond Grand Velas Riviera Nayarit, which enjoys a privileged natural setting with flowering, landscaped gardens beside a long stretch of pristine beach and a dramatic backdrop of the Sierra Madre mountains; and AAA Five Diamond Grand Velas Riviera Maya, located five minutes from Playa del Carmen, offering a sophisticated all-inclusive resort experience in the Caribbean with jungle and beach settings. In Puerto Vallarta, Casa Velas is a boutique adults-only hotel and ocean club located on the Marina Vallarta Golf Course, and Velas Vallarta, a family-friendly all suites resort and spa located on Banderas Bay. Mar del Cabo, a boutique hotel on Mexico’s Baja Peninsula, opened on December 5th as its only European Plan offering. Eduardo Vela Ruiz, founder and president of Velas Resorts, operates Velas Resorts with brother Juan Vela, vice president of Velas Resorts, by his side. For reservations or more information, call 1-888-407-4869, email reservations@velasresorts.com or visit https://www.velasresorts.com.